Life lately has been busy in our clinic (Hello flu and strep and croup and mono) and equally busy at home. My children are increadibly energetic and keep me on my toes every minute they are awake. My son is 4 years old and we are preparing for my daughter's 2nd birthday next month. We're in the throws of toddlerhood at the Brown house and anytime I stumble across an item that makes life a little easier these days it's a BIG victory. So as follow up to my earlier post (with all my favorite Infant Gear) I've decided to share with you all my favorite Toddler Gear recommendations too. 1. Okay to Wake Children's Alarm Clock: This clock has been worth its weight in gold! It's able to be programmed to light up (a bright green light) at a specified time. We set our son's clock to "alarm" at 7:00am and he knows he's supposed to stay in his room each morning until his light turns green. The best part is that you can turn the actual alarm sound feature off so that, on the rare occasion that our early riser is still asleep at 7:00am, the clock doesn't wake him up! And, what's more there is a nap timer which can be set for a set duration and then the clock will turn green at the end of the timer so this is how we keep track of our little guy's nap/quiet time (he can come out of his room when the light turns green). 2. Potty Seat Toilet Lid: Potty training is not my favorite part of being a parent (but a definite necessary step in finally being free of diapers). Friends of ours found these awesome toilet lids that you can purchase at Lowes or Home Depot with a built in child's size potty seat inside the regular lid. Unfortunately, our toilets are a brand that these lids don't fit on but it's definetely worth checking out. For your potty training experience, I'd also recommend purchasing a toilet tank potty hook for easy storage of a potty seat. And you'll need a sturdy, no-sip step stool too (so they can climb on the potty and also up to the sink to wash hands afterwards). 3. Avent Natural Cup : These were my favorite cups for early toddlerhood for teaching a child how to drink out of a real cup without a lid. The genius design features a spoutless cup with a unique spill-proof valve that's lip activated. Toddlers learn to drink from the rim so they're ready for grown up cups, while trainer handles make it easy for their little hands to hold on tight. 4. WaterWow Coloring Books and Reusable Sticker Pad : These are big favorites at our house. Both activities are mess free and keep our kiddos entertained for long stretches of time. WaterWow is a great on the go toy also (I whip it out at the restaurant while we're waiting for food, we throw it in the stroller, and use it on car trips too). The sticker pad has few more parts (so not as good for the car or stroller) but is also great for honing those fine motor skills. 5. Doodle board: Another go to toy for the stroller and car trips, both kids love to draw on these boards, then wipe it clean and start again! 7. Strider/Balance Bike : These are great for teaching young kids how to ride a bike. There are a lot of brands out there of balance bikes (and quite a range in price). I found this article was very helpful in choosing a bike for the size and age of each child. And before Junior takes his new bike out for a spin, be sure to pick up a helmet too! 8. Faucet Extender: This is a simple device which attaches to a faucet to direct the water out towards the edge of the skin. 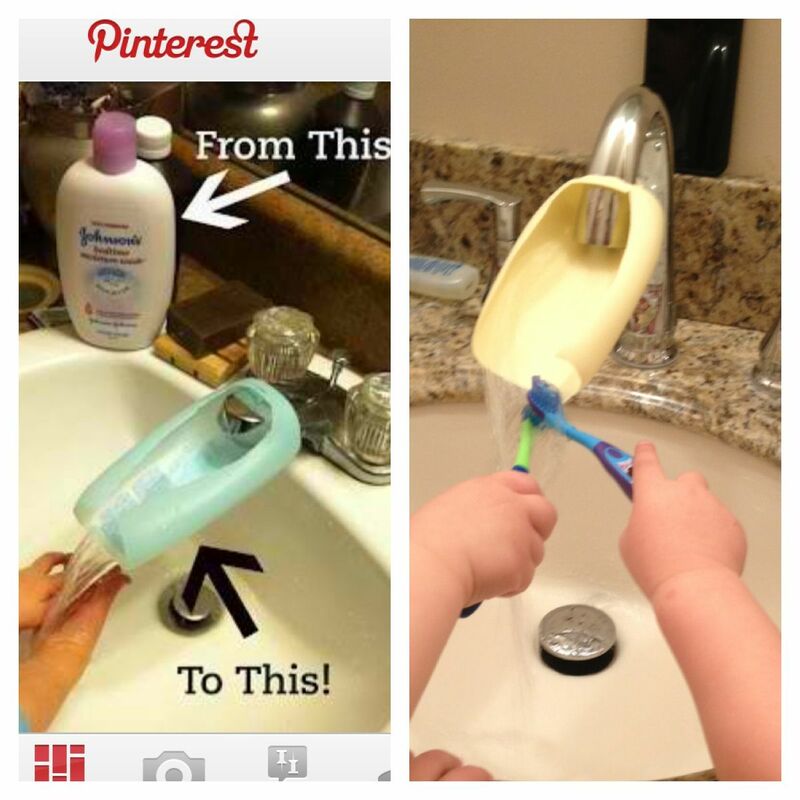 Simple but so helpful in allowing little ones wash their own hands (and I've seen some examples of how you can make your own). 9. Spin Toothbrush: I can't claim this idea as my own. Dr. Kate Lambert (one of the great dentists at Spangler & Rohlfing Pediatric Dentistry) suggested having kids brush with a spin brush which accomplishes several things: a spin brush makes brushing more fun and enables your child to do a better job brushing. Plus, kids who use a spin brush aren't as surprised when the dentist pulls out their brushing and polishing tools in their office. 10. Color Bath Tablets and Bubble Bath: At one point getting kids upstairs for bathtime was a struggle. Until we discovered the magic of color bath tablets (throw a few into the tub and the kids eyes light up as the bath water turns colors) and bubble bath. Each night we let the kids choose if they want colors or bubbles. And the colors don't leave any residue behind or stain the tub. Step Stool with Safety Rail - Pricey but very secure and slides right up to the kitchen counter while you cook. This is a great way to get kids involved in cooking. Kinetic Sand: The newer, cooler version of play dough. The kids love this stuff and mold it into all sorts of shapes (we use some old cookie cutters to make animals and flowers). I just have to make sure my wee one doesn't eat it! Whisper Ride : This is a win-win. Fun for kids and the long handle doesn't break the parent's back.